← Let ‘er Bee Free! Thursday morning: bees traveled to Sequim, WA. We picked them up at 11:30 a.m. (try driving home with 15,000 bees buzzing in your car – including a few hitchhikers that were along for the ride and on the OUTSIDE of the cage!). Friday: the weather was rather windy and cold, so we waited and got ready. See Ain’t Mis-Bee-Havin’ and the Warre Hive set-up. Saturday: Time to release the bees! Beautiful day! The weather was perfect! Sunday and Monday: We left them alone. The weather had dramatically changed from uncommonly warm and spring-like to our normal cold, drizzle-rain. There was not a soul at the entrance. I worried that anyone was even alive. I knocked on the hive. No sound. I opened up the bottom drawer. A little bee flew out, and the drawer wasn’t full of bees, so I figured they were just sleeping in. I returned later in the day, dressed in my bee suit, equipped with smoker, feather, jars of fresh sugar syrup, sugar spray, hive tool, and a nail, just in case I needed to help the queen out. I intended to use the smoker only if I really needed to, but I was a little leery of opening up the hive on a cold day. This is where the reality hit that I was invading “their” space. It was no longer “my” hive. The key, however, is respect, politeness, and don’t let them know you’re afraid. Keep the fear pheromones under control. I decided to give a little puff of smoke at the hive entrance, just to let them know I was coming. Or maybe to mask my odor. Or maybe just to confuse them. You can’t be too careful, right? I removed the roof and quilt box. So far so good. However, when I tried to take off the top cloth covering the feeder box, I was blown away by what I saw: a zillion bees hanging from the screen in a large clump. More like a giant glob of bees. If I wiggled the cloth, they moved in unison. And they were humming. Loudly. What’s this? They’re supposed to be down in the hive! How was I going to get to the Queen? I tried giving them a few gentle puffs of smoke, but they didn’t automatically descend into the hive – so I gave them a little shake. Many fell off; many flew out; some still clung tenaciously. My eyes were wide and my accelerated breathing was starting to fog up my glasses inside the bee veil. Finally, I set the cloth back down, picked up the feeder box (which has no bottom – just the four sides to protect the jars and keep the hive intact), and set them both on the ground. Next surprise: One of the pint jars of syrup was covered in freshly made comb! They were building off the jar! Wow. The symmetry is absolutely amazing – but this is not where it’s supposed to be! These bees are clearly not following the rules (my kind of bees!). Either that, or they are terribly confused (I can so relate!) Of the two pint jars of 1:1 sugar:water, the one with comb was almost empty, the other 3/4 full. I removed them both, and numerous bees followed. I still needed to find the Queen. I could see the push pin, but the cage itself was deep down in the hive, thickly covered with bees. Hmm. Not a good sign. And why did I put it so far down there? Oh yes, to keep it beneath the triangular piece of wood attached to the top bar. But how was I going to get my hands in there? It is very difficult to grab something small with thick vinyl (Vinylove!) gloves, but you couldn’t pay me to put my bare hands down there! A lot of comb was being built, attached to the center top bars, which was good – however, it just isn’t all that easy to pull out a bar thick with comb and a zillion bees. I gave them a couple more puffs of smoke. I am not convinced it “calms” them. I would think instead it affects their respiratory system and their breathing slows down. Breathe slowly. That would be me. And I don’t smoke. Next problem: I couldn’t get the push pin out. The other day, it was easy to push it in there when it wasn’t covered with bees! I tried using the hive tool. I finally got the pin out, but then I dropped the cage! It fell deeper into the hive box, on top of thousands of bees. I could see it there – just out of reach. I gave them a little puff of the magic dragon in the can. But my running and looking down over the hive only served to fog up my glasses even more – it was difficult to see the edge of the screen to the cage, covered with bees, of course, and even more difficult to grab it without pinching anyone. I managed to only push it further down. Yikes. Now what. Ah ha! But this is one of the advantages of the Warre Hive! Something falls down, just remove the box! Sure enough. The cage fell gently to the box below. It was covered in bees. The Queen was still intact. I could see the problem. When I originally pinned the cage to the wall, I must have accidently pushed the little flap of screen back over the hole. None of the bees could help her get out. And if she ate her way through the candy blocking the entrance, which she had not, she would still not be able to escape. She was trapped. I felt like the villain alien in some Grade B Science Fiction Reality show (is that an oxymoron? A Fiction Reality?). Clearly, I was only trying to help these little creatures. To them, however, I was this smoke-breathing gargantuan dragon, tearing apart their home, destroying their handiwork, taking away their food supply, and now stealing their Queen! All alarms were being sounded. Only we hear at different frequencies, and I could not hear them. It was chaotic frenzy. 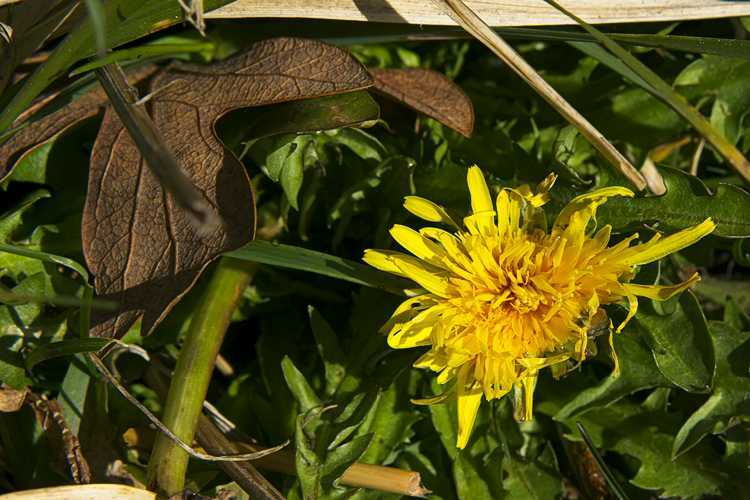 They were bonking me in the face, buzzing all around my head, darting back and forth; numerous bees landed on my gloves; others were on my clothing… “Why is this giant so dense? ?” they were screaming. Did I mention? I love my Vinylove gloves and my beekeeper veil and the multiple layers of clothing. Plus, one can never have too much Velcro. Breathe slowly. Do not let them sense my fear…. Yes, it was the creepy-crawlies / heebie-jeebies all rolled into one. Still, I carried on. I MUST GET THE QUEEN OUT. I focused. I realized it was they who were afraid. I was not getting stung or hurt. They, on the other hand, were being invaded, exposed, and unfortunately, a few got a little smushed. Hate that sound. It’s kind of a little crunch. Sorry, girls. Clumsy giant. I didn’t mean to. I took the nail out of the Beekeeper kit and tried to pry loose the candy. I had been advised that if I gently poked a hole through, being careful not to hurt the Queen, who was frantically jumping this way and that in the little cramped container, that I could just put my finger over the hole and release her into the hive. Good luck trying that wearing Vinyloves. I do not love Vinylove. Unfortunately, the candy was not all that easy to get out. It was goopy and waxy. I eventually managed to get a little hole through, though. It was the best I could do. By this time, the hive had been open for quite some time. I decided to just hang the cage back in and close things back up. We’d all had enough excitement for one day. This time, though, I pinned the cage to the top of a bar 2nd in from the end. That way, I could easily remove it without getting in everyone’s way, and it wouldn’t interfere with where comb was already being built. 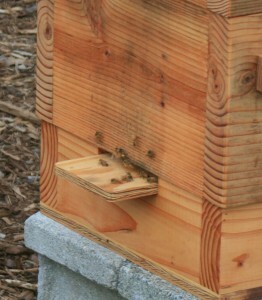 I tilted the box sideways, pointing toward the center of the hive. I made sure she could get out. 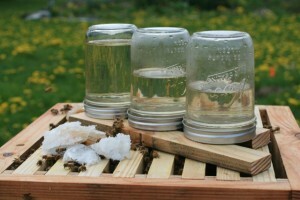 I placed new jars of sugar syrup back in the hive and some more pollen patty and rock candy. I covered it back up with the box and the cover cloth, the quilt, and lastly, the roof. I tightened things down with the Bungie cords and quietly walked away. Whew. The dragon will retreat into her cave for the night. Wednesday (today): As much as I hated to open things back up so soon, I knew I needed to make sure the Queen was safely out and remove the cage before they built comb all around it. 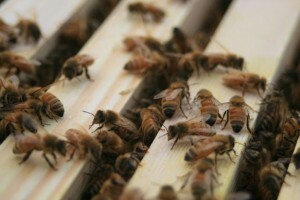 These bees were obviously Type-A workaholics; they would work until they die, to which I’m sure many of us can relate. It would also be good to check on the syrup supply. 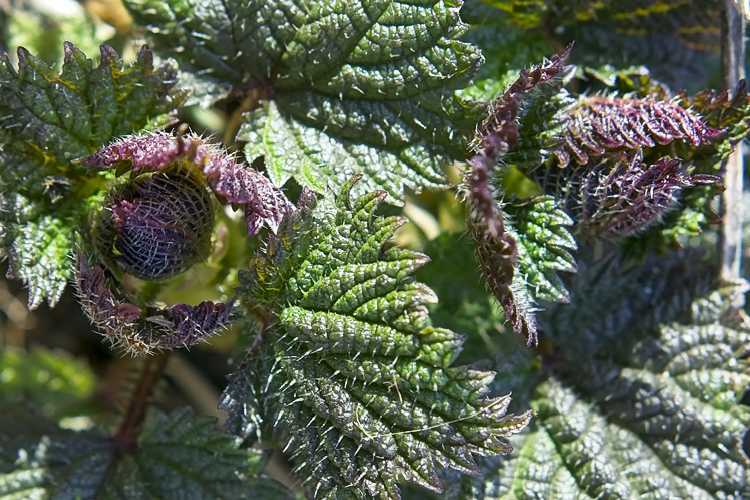 Some folks tell me they can go through a quart of syrup in a day in cool weather before the blooms are out. But these bees only went through a little over a pint over the entire time, which told me they were finding food outside the hive, but probably also appreciated the indoor food on cold days. It was 10:30 a.m., 57 degrees. The forecast was for afternoon rain and more rain throughout the week. Now was my moment. As before, I dressed up in 4 layers of clothing (this could get hot! ), donned my veil and Vinylove gloves, lit up the little smoker. I brought along a pair of needle-nose pliers, just in case, and also a small tarp, which would be handy to set the feeder box on. Puff puff. The bees start buzzing. Something’s going on. Do they remember me? I took off the roof and the quilt. I gingerly peeked inside the top. Puff puff. Stand back and wait a moment. Quite a different experience this time. The bees were busy. They were feeding on the candy and syrup; crawling up and down between the bars. Fewer were obsessed with me and what I was doing. They were no longer clinging to the cloth in a clump. The push pin was easily accessible. All I needed to do was to move the syrup jars out of the way and lift up the bar enough to pull the cage out of there. As I pulled up the bar, a glob of bees came along with it. They appeared to be making comb. 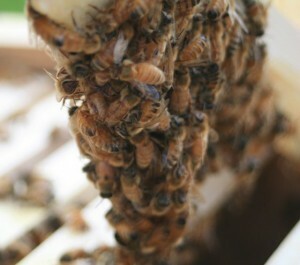 There were a few bees on the Queen’s cage, but not too many. I could gently push them off with my finger. I realized I could do this with my hands; I didn’t necessarily need the feather. The bee cage was empty! Success! I did not try to find the Queen. I was sure she was in there, doing what Queens do, catching up on her responsibilities. Everyone has a role. Everyone knows what they are supposed to do. Me, too. I put the syrup back on the bars and added an extra jar to cover them over the forecasted cool weather. I put the feeder box around them, covered with the top cloth, then the quilt, then the roof. I tightened down the sides against the spring winds that can whip through here hard enough to blow over my corn crop. The whole procedure took me less than 15 minutes. Success! Long Live the Queen! The bees were already coming and going outside the front entrance. And the best part: they were ignoring me. They had better things to do. 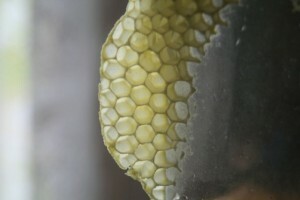 The Queen must be getting ready to lay eggs, if she isn’t already. And you gotta be amazed at how hard those girls were working to build comb! Incredible architecture in wax! Something very satisfying about seeing them all so busy, fulfilling their life missions. Singing, indeed. Some were already returning with pollen. The weather might be changing, but they didn’t seem to mind. As an aside note, when I attended my first local beekeeper’s meeting, I couldn’t help but notice how “bee-like” the instructor was. He confessed he spent an embarrassingly large amount of time watching his bees. I suddenly completely understood. 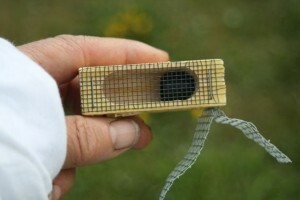 Away from the hive, I more closely inspected the cage. I could see how the wire mesh could easily be pushed back over it by mistake. Something to be aware of. I examined more closely the piece of comb that had been built on the syrup jar. Oozing from the cells, a clear thick liquid, dripping like dew. Mmmm. It tasted remarkably like honey. I think I could get used to this. Maybe. I have been looking at all the blogs you have writte with joy. Thank you so much for all the great information. The garlic you sent me is up and looking wonderful! Do I dare try the bee hive root next? Warmer weather is on its way!!!! Hooray for the Mystic Garlic! And I hope the Russian Giants are growing to gargantuan size for you! Yes, the commitment to get bees has been quite an adventure! Something I’ve wanted to do for a long time … we live in such an ideal place for them (other than our frequent windy rainy weather – but we have lots of good forage plants). The more I read about the difficulties they face in survival, the more I knew it was something we needed to do. Great to hear from you again, Linda!